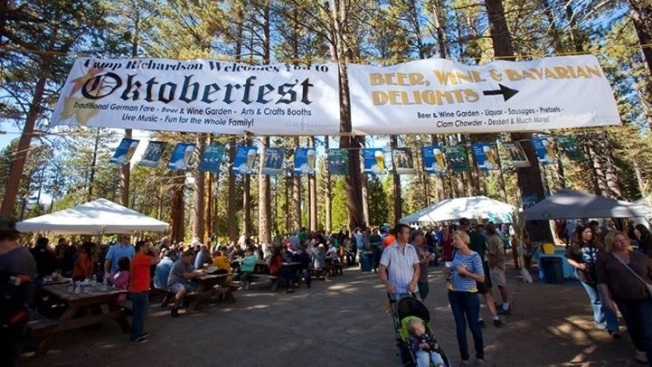 Longing to savor bratwurst near Lake Tahoe? Here's your party. A venerable Lake Tahoe tradition marks its 22nd annual go-around over the first weekend in October. SETTING MAY NOT BE EVERYTHING... in a celebration, for the food and the drinks and the themes and the people (most importantly, natch) do their part to lend texture to a party. But where a festivity takes place, its location and surroundings, can do much to up the general atmosphere of an affair. Think of a Halloween buff turning an apartment into a castle for the night, or how a backyard might become Santa's workshop, at least for an hour or two. SATURDAY, OCT. 1 AND SUNDAY, OCT 2, and the 22nd annual Oktoberfest will include a host of classic must-dos, from polka dancing to bratwurst eating to craft booths to the all-important showdown that finds dogs and their peoples gussying up in photo-ready costumes. Soon the snow shall be a-whirlin' in the peaks near the lake, and ski togs'll be seen on many flake fans. But for now, when autumn is at its mellow zenith, best find a stein to hold, and a pumpkin to buy, and a song to swing to, at one of the most Oktoberfest-y settings around.